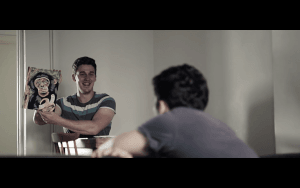 Shopping Channels is the first narrative feature film from Pinpoint films, a small, Cheltenham-based production company making no-budget indie films in the UK. The film is the story of Mike (Jamie Satterthwaite), a rent-a-car management trainee who is becoming unsatisfied with the routine that his life has become. After a house party, Mike and his halfwitted housemate Pete (Richard Summers-Calvert) awake to find a stranger on their sofa – Maddie (Sara Jewell). Mike can’t help but find Maddie’s care-free ways alluring and offers to drive her to a wedding in Northern Scotland. This road trip is where the bulk of the film takes place and parallels the journey Mike and Maddie take in establishing their bond. Shopping Channels is very much a comedy, perhaps even a romcom, but of a particularly modern strand. It uses the humour of the everyday, and the laughs tend to come more from the cringe-humour of The Office rather than the escapist gags of Hollywood. The climax of this (if you’ll excuse the pun) is a scene in which Mike and Maddie practice dirty-talk while settling down to sleep in his ‘sensible’ parked car. Brilliantly written and performed, the sequence induced, at least in me, the kind of horrified laugh that you simply need to emit as not to be overcome by nervous tension. In fact, most of the comedy is derived from the sweat-inducing awkwardness of the lead couple. The film uses all of the uncomfortable moments of a new relationship to make us squirm, and we do because of their gut-wrenching familiarity. Viewers may find the film dialogue-heavy but this is inevitable given the lack of money involved. Action is expensive to shoot, dialogue is not. There are sequences that, intentionally or not, feel a little like Jim Jarmusch’s Stranger Than Paradise in their sparsity. I’m a fan of breathing space in cinema, others may be frustrated. That said, the narrative is engaging throughout and the large amount of dialogue is often well written. There are a few moments of cliché that disappoint. The character of Pete, the comic-relief dunce-sidekick, also becomes a bit tiring in his idiocy. But there are also moments and nuances in Shopping Channels that will glimmer with a painful relevance to the lives of all British post-university twenty-somethings. There are even smatterings of commentary on the banality of modern life: Mike, at one point, gives a lengthy explanation of how he ‘cheats’ the Nectar card system at Sainbury’s by claiming to be reusing bags that he is not. His total Nectar points so far? £12.63’s worth. “It’s a real loophole”, he proudly exlaims. There are some minor technical blemishes – sound levels sometimes miss the mark, for example – but the film is far more polished than you would expect. The cinematography is well thought out and there are some sequences that are visually magnificent. It is clear that an awful lot has been done with few resources and for that alone Pinpoint Films should be applauded. Shopping Channels gets its title from Mike’s obsession with late night teleshopping and infomercials. In those terms, the film may have been low cost but the quality achieved here makes it a true bargain. To clarify, it simply isn’t possible to evaluate Shopping Channels without taking into consideration the economies of its production. With next to no budget the film delivers a solid hour and a half of narrative entertainment, a heart-warming journey and some memorable laughs. In economic terms, then, it can only be said that Shopping Channels is absolutely spectacular value for money. Shopping Channels will be showing at UK film festivals in the coming months and is set for release in April 2016. You can keep up with this and other projects by following Pinpoint on twitter at @pinpointfilms.